A boy was brought to a well-known clinic after complaints of stomach pain and diarrhea for 2 days. The parents have attempted to give the boy all types of medicine to ease the pain but nothing seemed to work. The doctor then proceeds to question on the food that the boy had eaten for the past 2 days. According to the parents, the boy had not been eating anything for the past 2 days as he had no appetite. He only drank milk and even that also causes him to vomit. Upon further questioning, it was discovered that the boy ate Water Spinach at a restaurant the night before he started having diarrhea. The doctor immediately performed an x-ray and found that in the intestine of the boy contained many small leeches- that have most likely been bred by one or a few leeches that accompanied the vegetable. 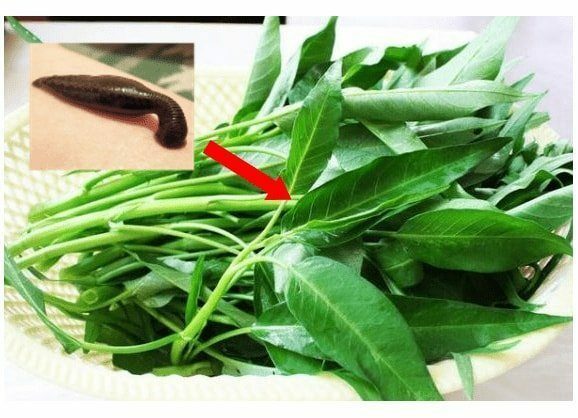 As Water Spinach is a dish that is typically not cooked long (to preserve the crispy bite of the vegetable), the leech may survive the fire. This is the first time that Ive heard about the case of leeches breeding in someones stomach. Microorganisms enter our body all the time and our stomach acid will kill most of them. Leeches are probably not found in Water Spinach but in a variety of other water-based plants. For the leech to be able to breed easily in such an unfavorable environment, the boys overall health must have been compromised prior to that. When I stayed in Thailand, we eat Kangkung all the time because it is easily available and taste delicious when cooked with chilies and shrimps. Ive never heard of any similar case there. Furthermore, in the west, raw vegetables in the form of salad is a very common and some of these vegetables are not even properly washed- it is not surprising that a lot of different creepy crawlies make their way into our digestive system. Yes, admittedly food poisoning can be quite common with unwashed vegetables but it is normally not severe unless the food is contaminated wit a poisonous substance or of those that the pesticides on the food is not washed off.